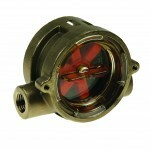 Flow indicators are essential in technical monitoring and measuring processes, providing a visual indication of the liquid or gaseous flow during system operation. Visual flow indicators are common in plant protection systems to determine that coolant or lubricant is flowing to engines, pumps or compressors. Our range at Applications Engineering includes every component you need to manage a fluidic circuit, including flow switches and sensors, visual flow indicators and variable area flow indicators. All of our components are chosen and tested for durability, reliability and overall quality, to ensure that your system works safely and consistently.